When Sandy died he was replaced by Charlie, a big gentle and friendly chap who was fond of food. 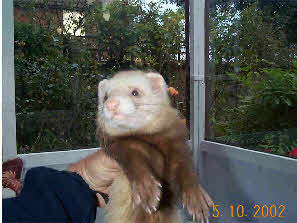 He was a Sandy coloured ferret that was part of a litter publicly displayed at Godstone farm. Later in life Charlie suffered the sudden loss of the use of his rear legs, possibly through a spinal injury, the cause was uncertain, but I recall he had a habit of climbing onto the plant staging in the rear lean-to, using a chair for access. I speculate he fell to the floor injuring his back; I now prohibit ferrets from access to the staging to prevent possible injuries. The bottom picture shows ferrets housed at Godstone farm that formed part of the well kept and interesting display of farm animals that children can see and learn about. Many of the common farm animals could be petted by children (ferrets excepted) but that was withdrawn following a highly publicised outbreak of illness of some visiting children, caused by a possible failure to wash their hands prior to eating despite notices to do so. That said, I would recommend a visit to Godstone farm. 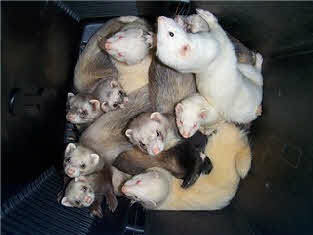 The group shown below are ferrets temporarily placed in a dustbin while their cage was cleaned .